I have mentioned my love of japanese food right? Let’s talk about it some more then, shall we? I find japanese food to be such a comfort. In fact, when I was in getting some blood work done (which I’m a total wuss about) I mentioned it to the nurse when she was asking about my most comforting foods to distract me. Talking food keeps me conscious…is that an obsession? She was honestly surprised. Especially, when I mentioned it was sushi first, then teriyaki, that makes me feel all warm and fuzzy about the world. She expected to hear mac and cheese or perhaps some sort of pot pie. Nope, if the world has let me down bring me sushi, teriyaki, and green tea….stat! In case of emergency break out the green tea ice cream. Slice the beef thinly and place in a plastic bag and cover with 1/4 cup of soy sauce and 1 tbl of honey. Allow to marinate for atleast 4 hours, overnight is perfection. Remove the beef from the marinade. Discard marinade. Heat the pan or wok to medium high. Toss in the garlic and shallot and stir around for about 30 seconds. Add the beef and cook until almost done. Meanwhile, combine the remaining soy sauce, honey, water, cornstarch and sherry until smooth. Set aside. Add the broccoli to the beef with a sprinkle of water. This will give off a bit of steam for the broccoli to cook just slightly. I like my Broccoli barely cooked, if you like more add a bit more water and a bit more cooking time. Add the sauce and cook until thickened. Serve! Serves 2 generous portions. Each serving contains 240 calories, 4.6 grams fat, 18.6 grams carbs, 1.7 grams fibre, and 29.4 grams protein. Great on rice or noodles to complete that take out japanese experience. 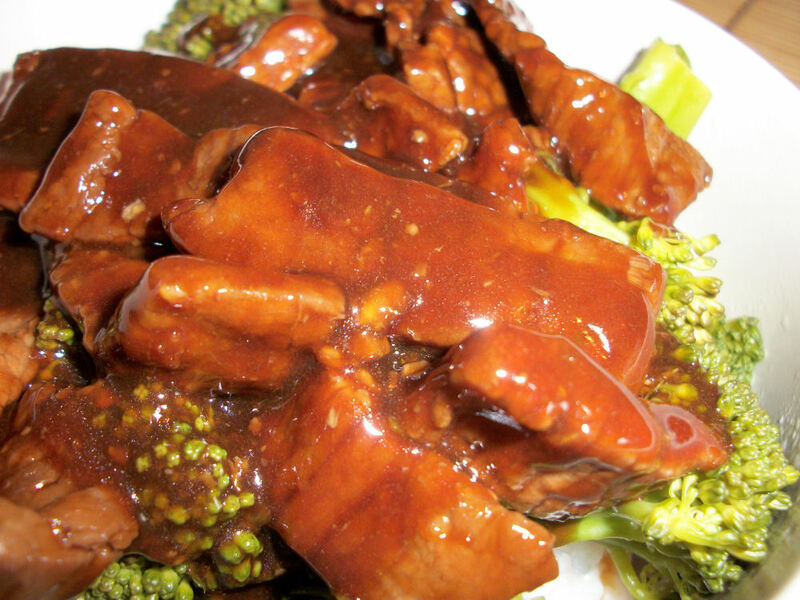 This entry was posted in Comfort Foods, Dinner and tagged Beef, broccoli, Garlic, Honey, sherry, soy sauce. Bookmark the permalink.